Yes, they happen. Probably a lot more often than we recognize. 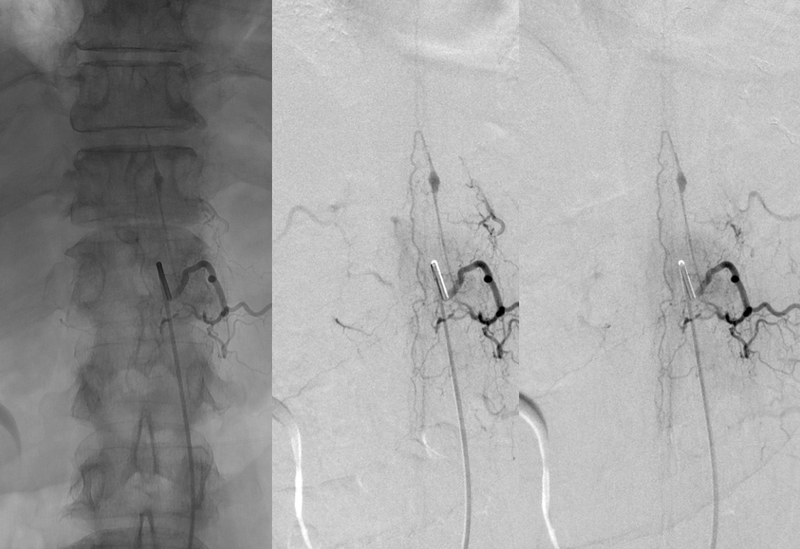 It is highly likely that many patients with hemorrhage around the cord which is caused by an aneurysm are not diagnosed correctly because they do not undergo a spinal angiogram. An MRI is usually done, showing blood products, without abnormal vessels surrounding the cord, and thus the bleeding is felt to be “cryptogenic”. Unlike brain aneurysms, spinal aneurysms tend to be very small and are almost never recognized on an MRI. A spinal angiogram is usually necessary for diagnosis. It is also a fact that many spinal angiograms are unfortunately inferior in quality. 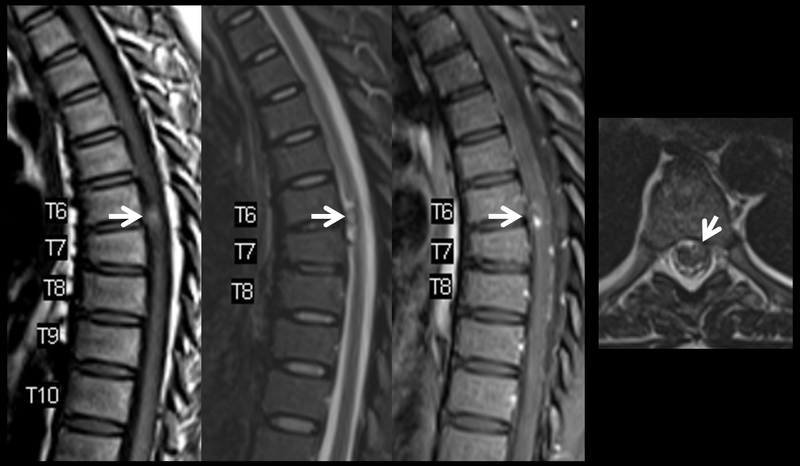 Because natural history is favorable (rebleeding is rare) and many patients recover without any intervention (see amazing examples of plasticity in anterior spinal supply below), the end-result can be a “cryptogenic hemorrhage” diagnosis. However, in the minority of cases when they do rebleed, outcomes seem to be quite bad. There is a variable amount of blood products in intramedullary spaces. 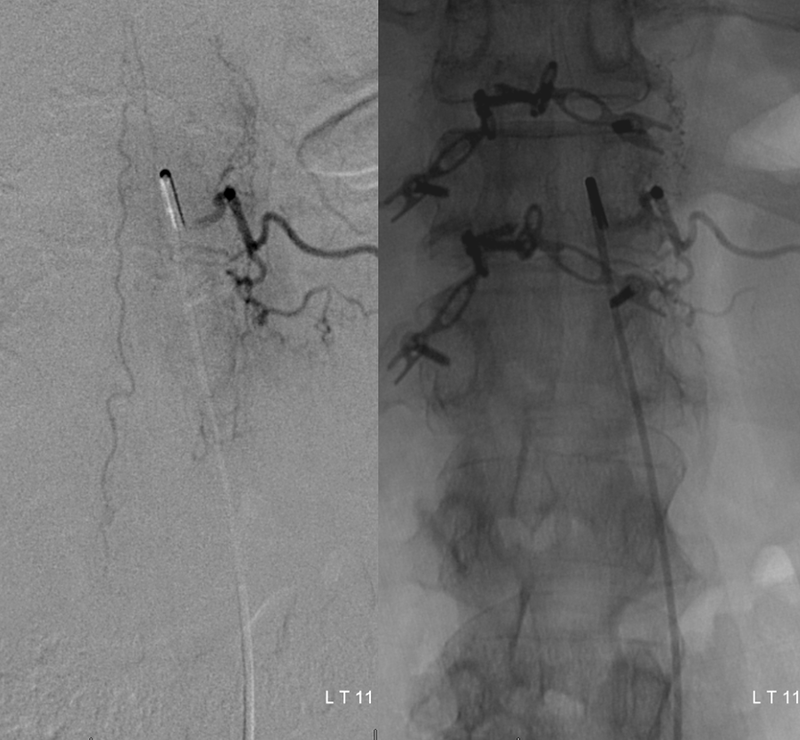 The cord is variably compressed but otherwise normal, without increased surface vascularity as might be seen in a dural fistula or another vascular malformation. 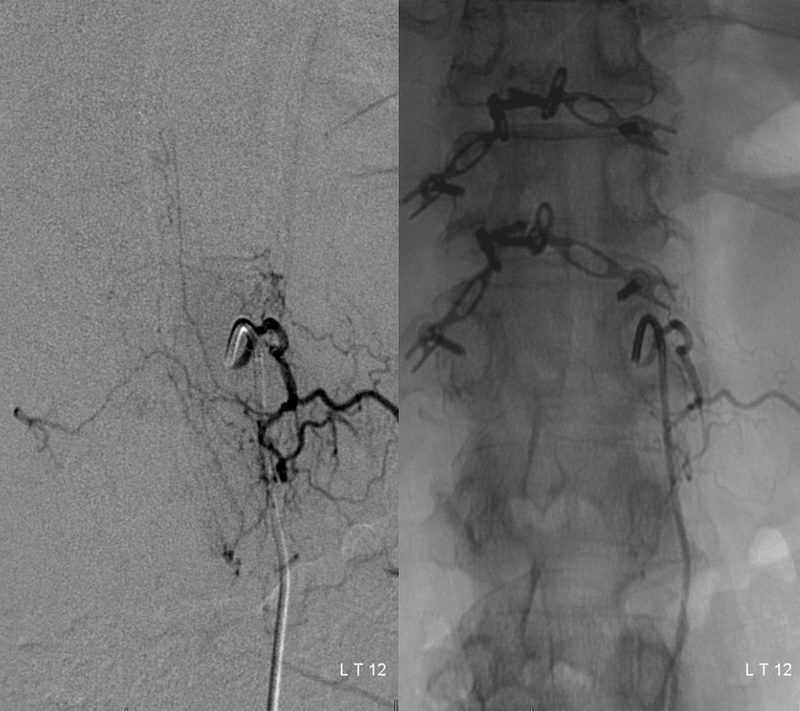 If something like this is seen, the probability of spinal aneurysm is very high, and spinal angiography should be performed by an experienced operator. Another MRI. See the pattern? 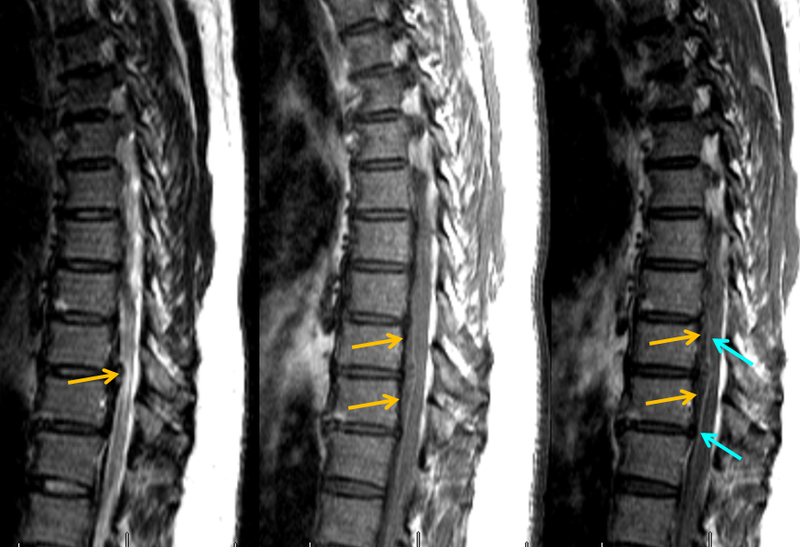 This middle-aged man presented with acute back pain, followed quickly by lower extremity paresis, sensory level, and incontinence — typical spinal hemorrhage presentation. 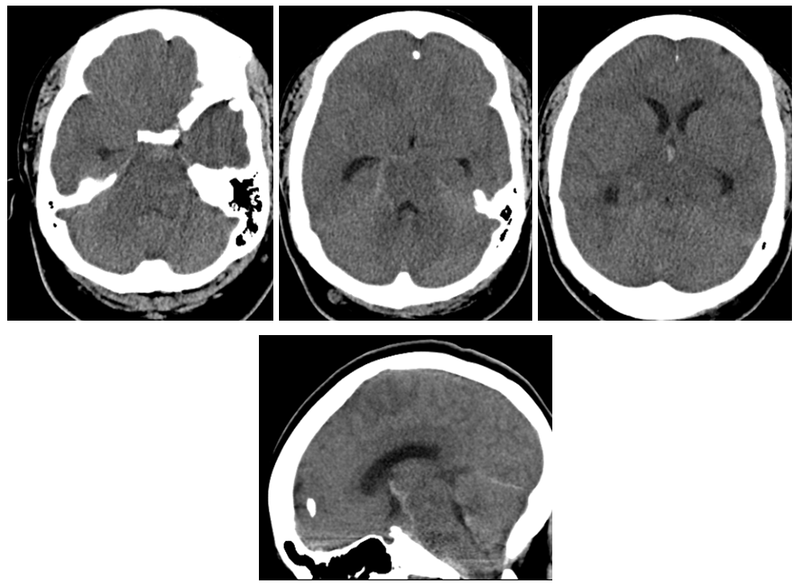 Notably, nonhemorrhagic spinal artery infactions present in the same manner — onset is usually painful, even when there is no bleeding — unlike most cerebral ischemic infarcts. 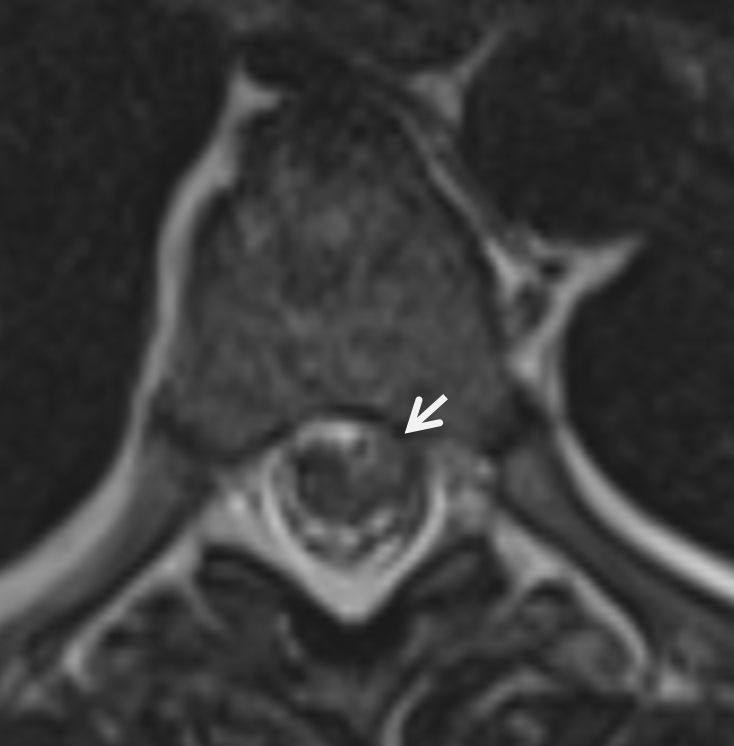 MRI of the thoracic spine shows an intradural, extramedullary hematoma (orange arrows), which is best seen when outlined by a normal ventral spinal vein (light blue) on post-contrast T1-weighted images. 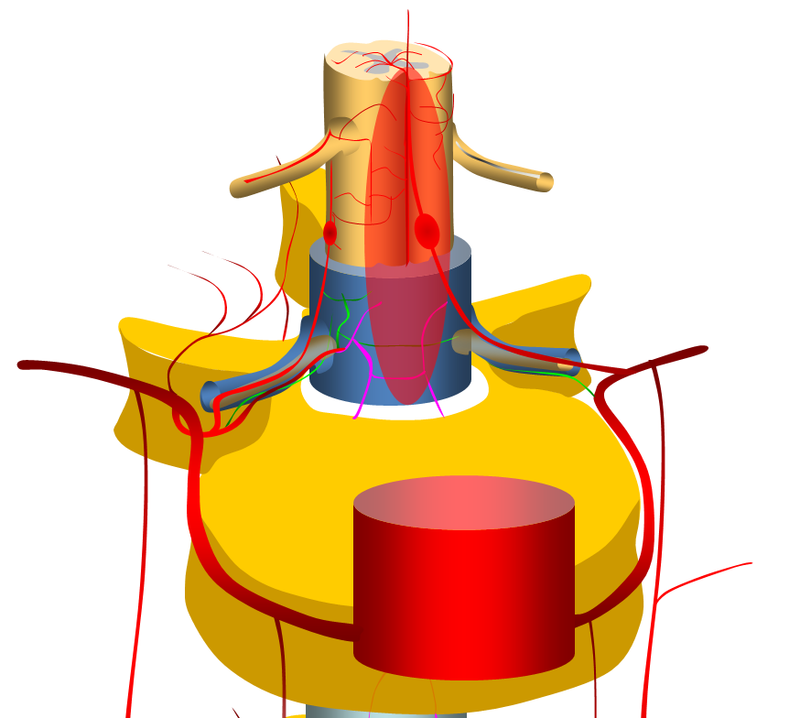 Fortunately, another sizable contribution to the anterior spinal axis was located from the right T7 segmental artery. 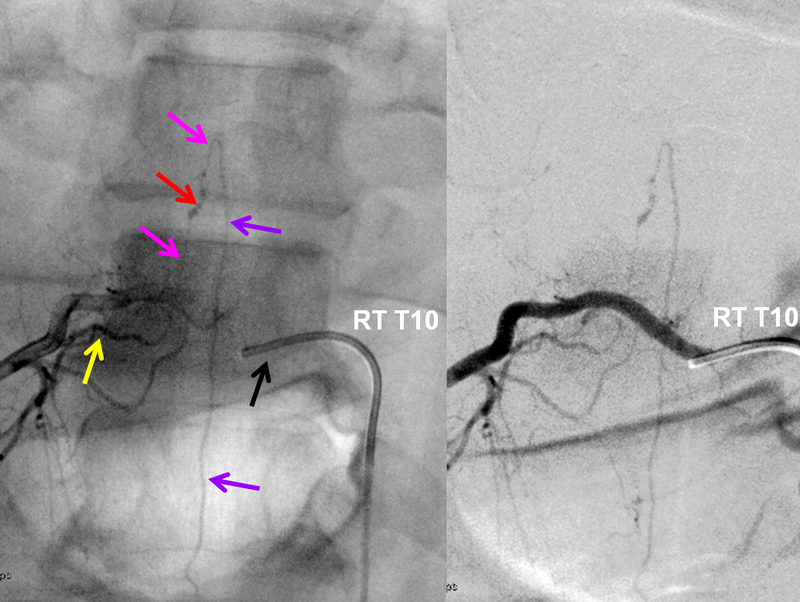 With the microcatheter wedged in the right T10 level proximal radiculomedullary artery (white arrow), thus obstructing its flow (test occlusion), the right T7 segmental artery is injected through a second diagnostic catheter. 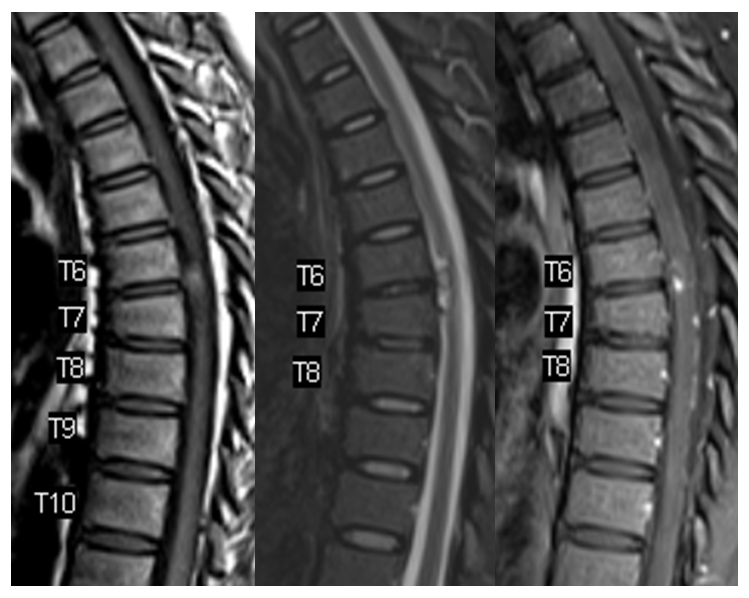 You can see robust reconstitution of the entire spinal axis, including the portion below T10. 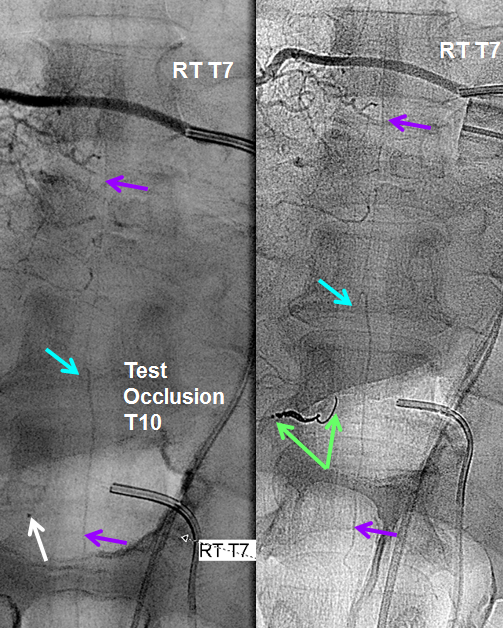 Therefore, the patient “passed” test occlusion, enabling sacrifice of the right T10 radiculomedullary artery with coils (green arrows). 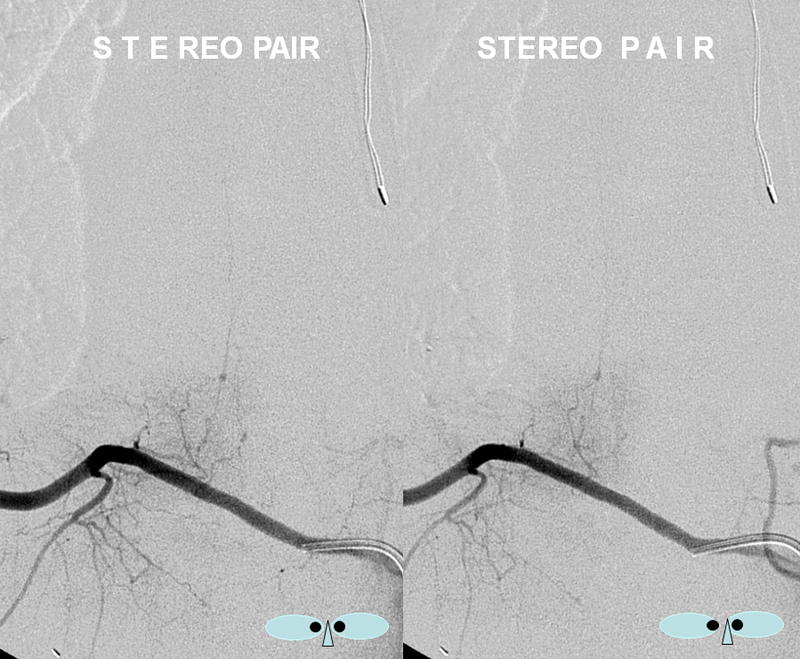 Notice that coils do not reach the level of the pseudoaneurysm. 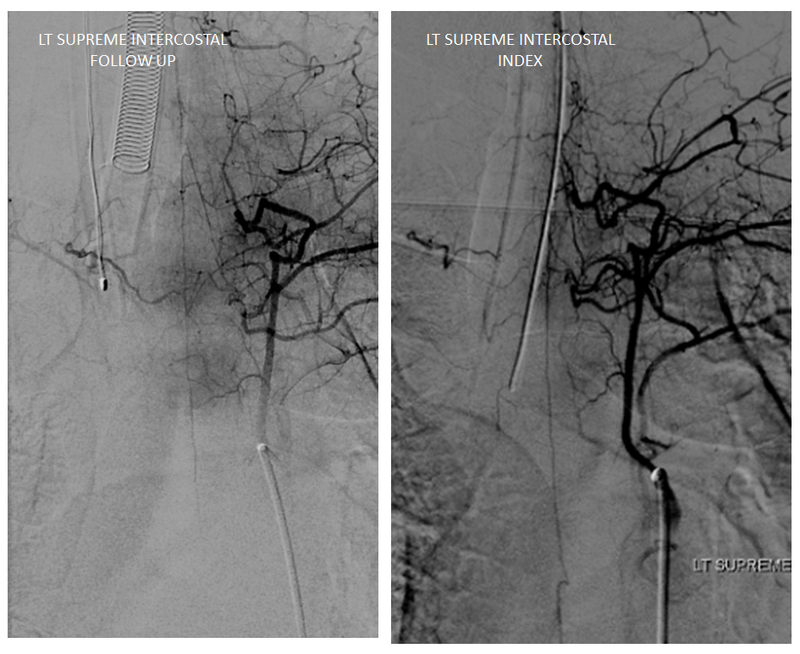 We felt this to be acceptable, as no other branches arise from the T10 radiculomedullary artery to enable its continued patency. 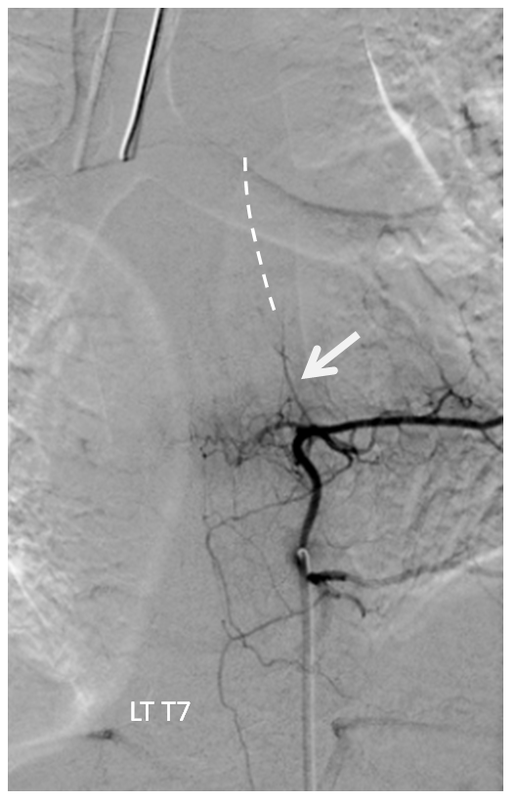 With no outflow, the artery and its dissecting aneurysm will thrombose. 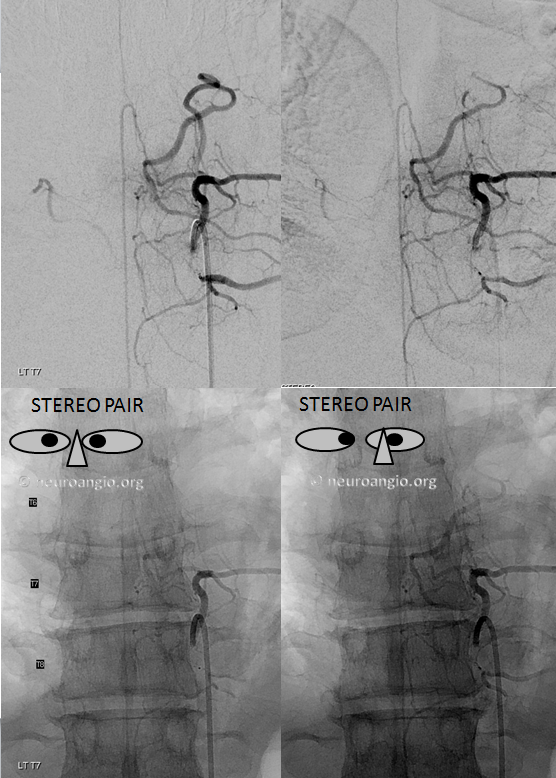 In fact, the post-coiling image on the right no longer opacifies the dissecting pseudoaneurysm. The patient recovered well and has not re-hemorrhaged. 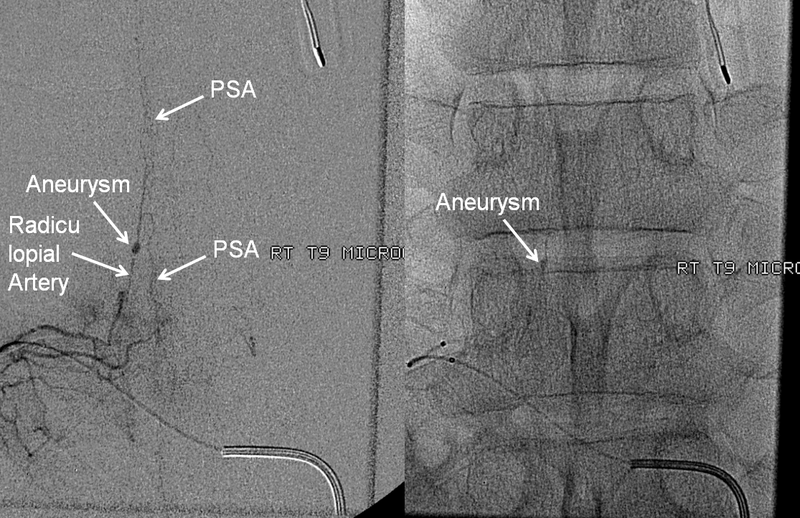 Finally, the anterior spinal artery at the conus level is supplied in retrograde fashion by the posterior spinal artery (image below, not labeled. There is an image even lower done which explains it. Take a look). This is distinctly abnormal. It should be the other way around. 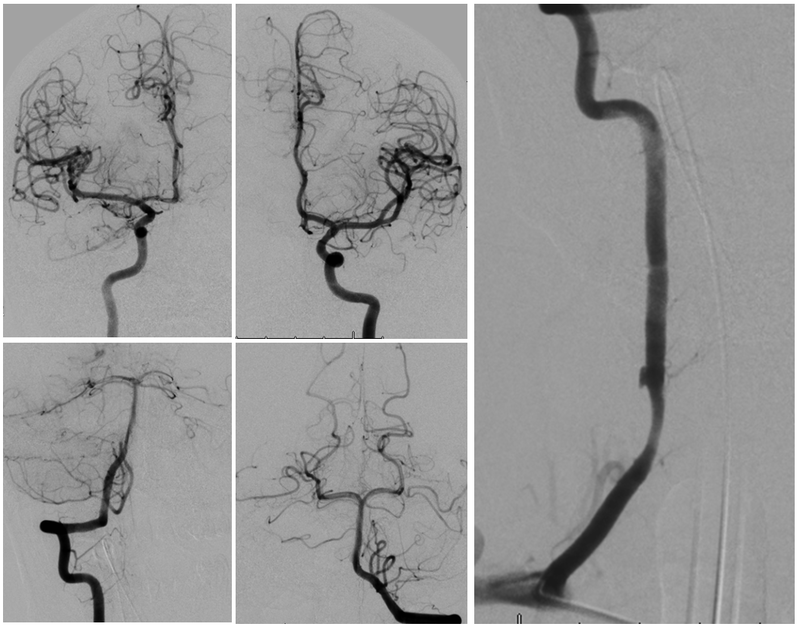 The conclusion is that an aneurysm must have been present at the left T7 radiculomedullary artery, which is the missing “Adamkiewicz”. The aneurysm and the Adamkiewicz have thrombosed. 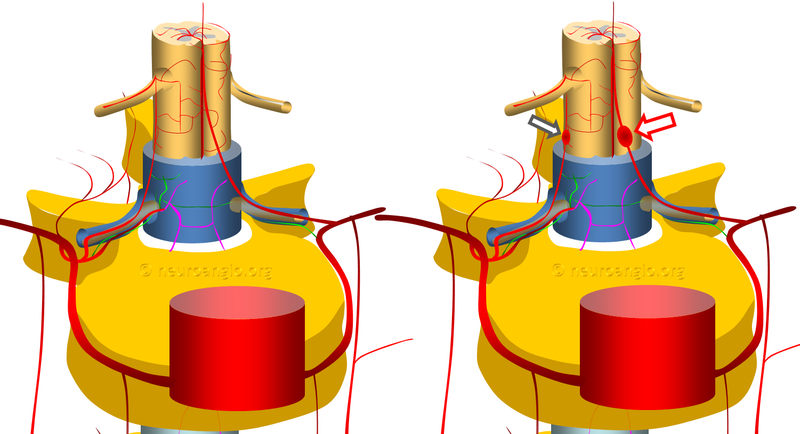 Fortunately, there is enough collateral supply between the Supreme Intercostal and Left L1 posterior spinal to allow for cord perfusion. 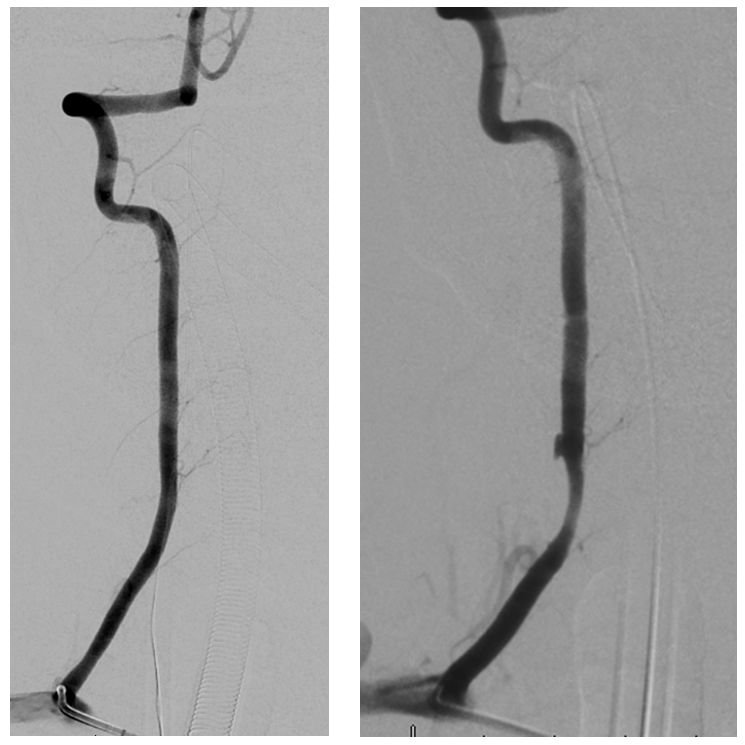 The left T7 Adamkiewicz has now recanalized and resumed its contribution to the supply of lower thoracic ASA. The aneurysm is gone. 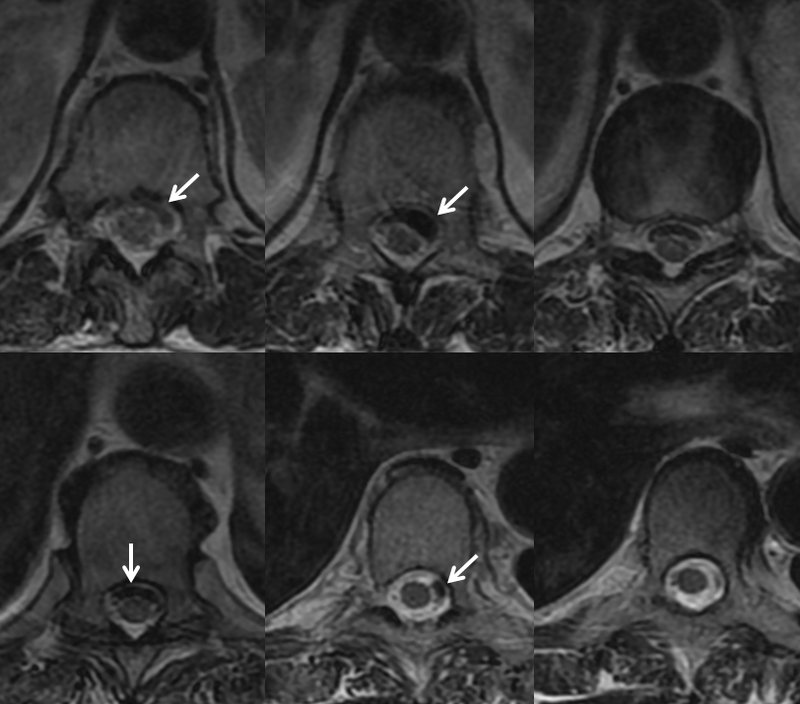 Notice the subtle but highly unusual tortuosity of the intradural Adamkiewicz (white arrow). 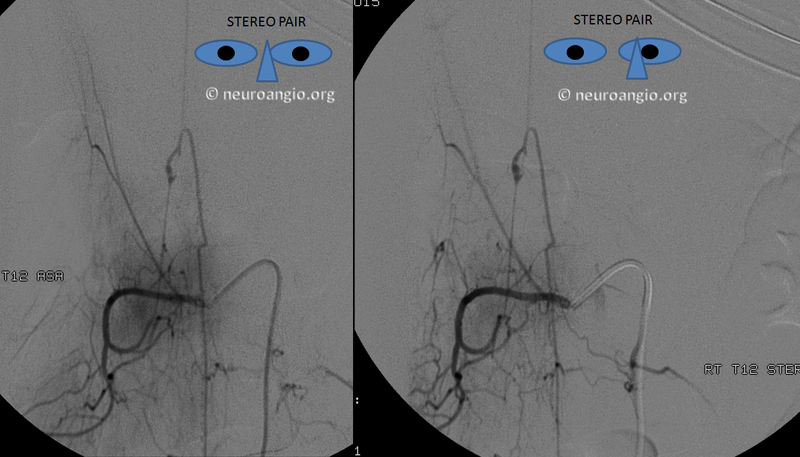 This artery is never, ever wavy, even in the most atherosclerotic bodies. 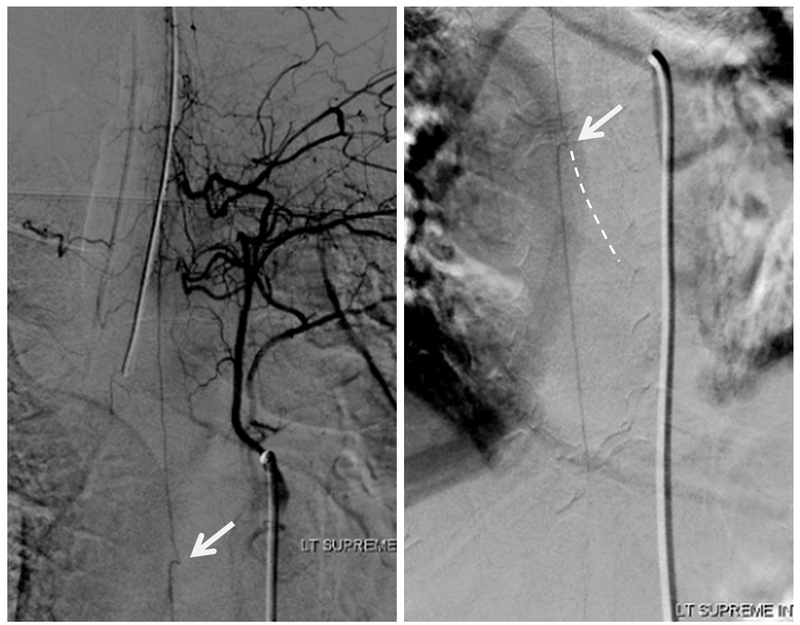 The tortuous appearance is sequela of recanalized radiculomedullary artery dissection. 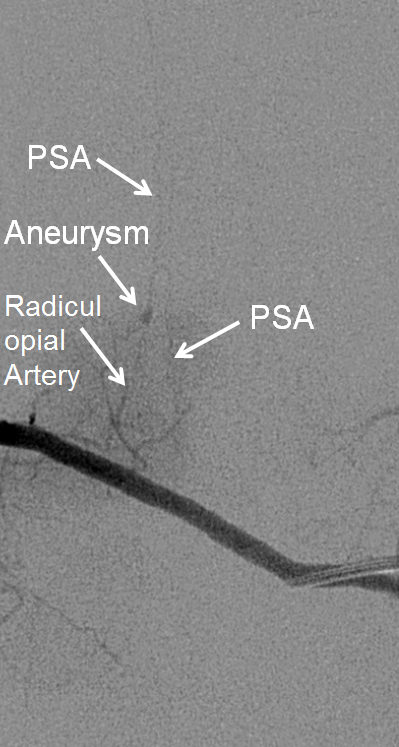 These are aneurysms on the radiculopial artery (posterior spinal networks supply) rather than radiculomedullary atery (anterior spinal supply). 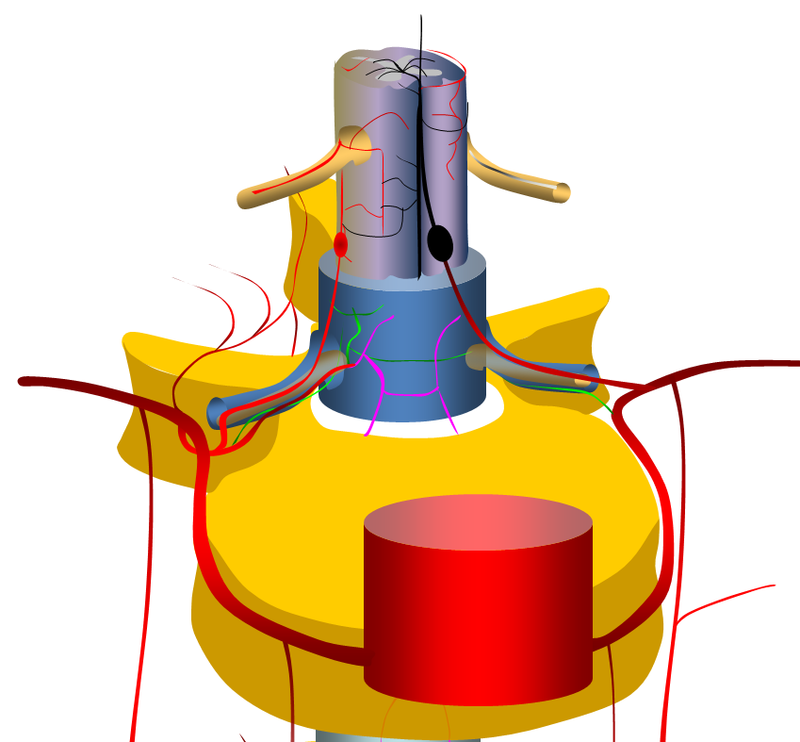 They are much better tolerated because the main issue is bleeding rather than occlusion. 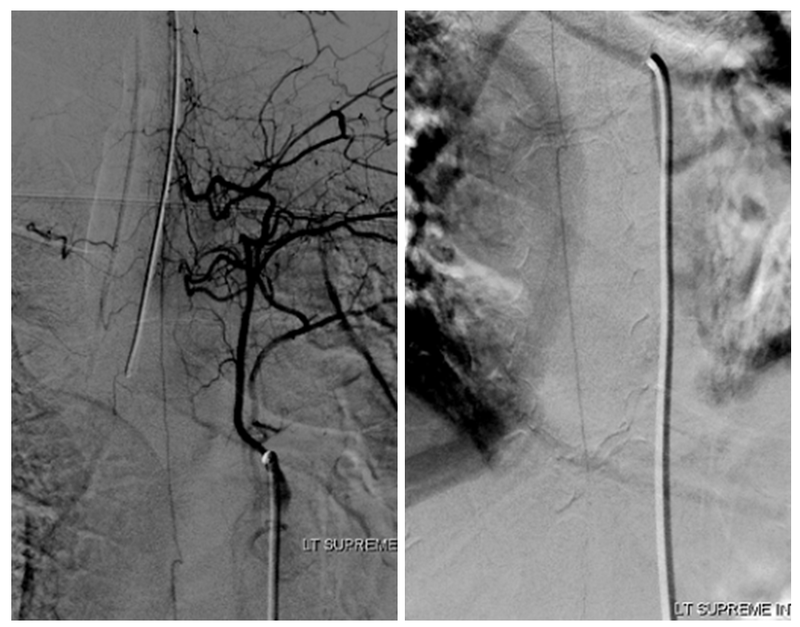 Occlusion of radiculopial artery is very frequently asymptomatic. 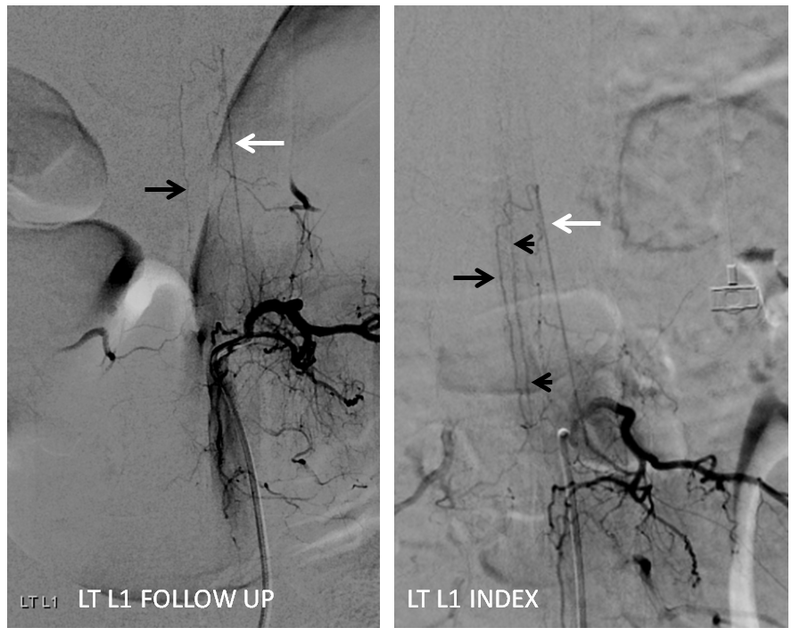 Bleeding can cause cord dysfunction because of mass effect, but it is extrinsic to the cord and usually carries an excellent prognosis (“usually” with understanding that the number of cases is quite small). 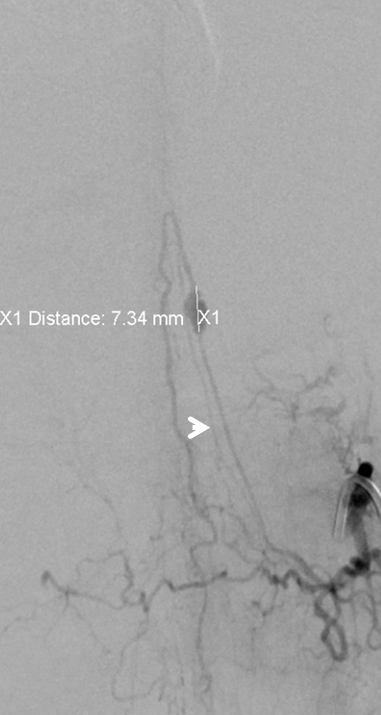 Microcatheter run, better showing the aneurysm and its off-midline relationship to the spinous processes. Notice unusually large size of the posterior spinal artery segment. 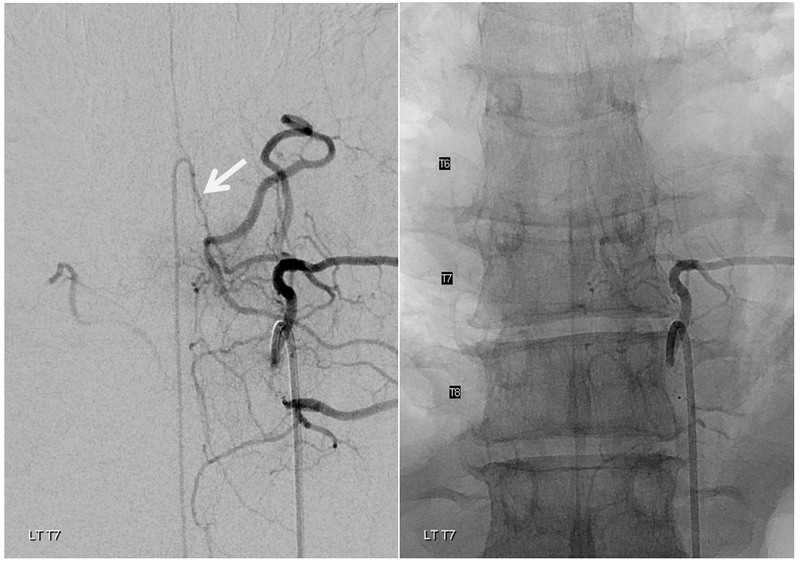 In fact, prominent surface cord vessels, hyperemia, and arteriovenous shunting were seen throughout the cervical and thoracic spine, consistent with an acutely inflammatory process. Lasjaunias, Berenstein, and Ter Brugge; Surgical Neuroangiography, 2nd edition, Volume II — the best reference. Note that academic institutions and other organizations may have access to full book PDF version through SpringerLink. Ansgar Berlis, Kai-Michael Scheufler, Christian Schmahl, Sebastian Rauer, Friedrich Götz and Martin Schumacher. 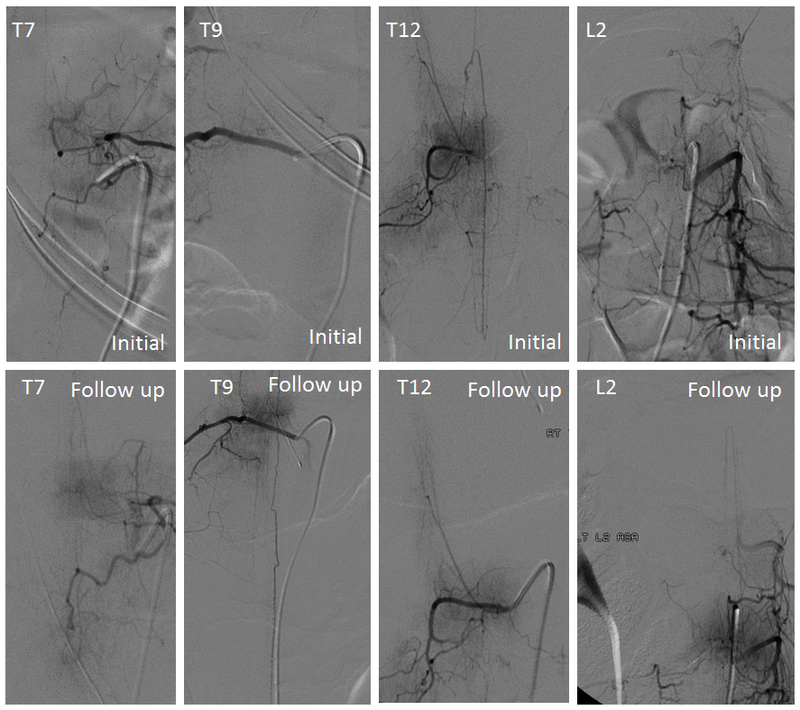 Solitary Spinal Artery Aneurysms as a Rare Source of Spinal Subarachnoid Hemorrhage: Potential Etiology and Treatment Strategy. AJNR 2005; 26, 405-10. Open access.